We’ll take anybody. We don’t even require membership classes anymore. 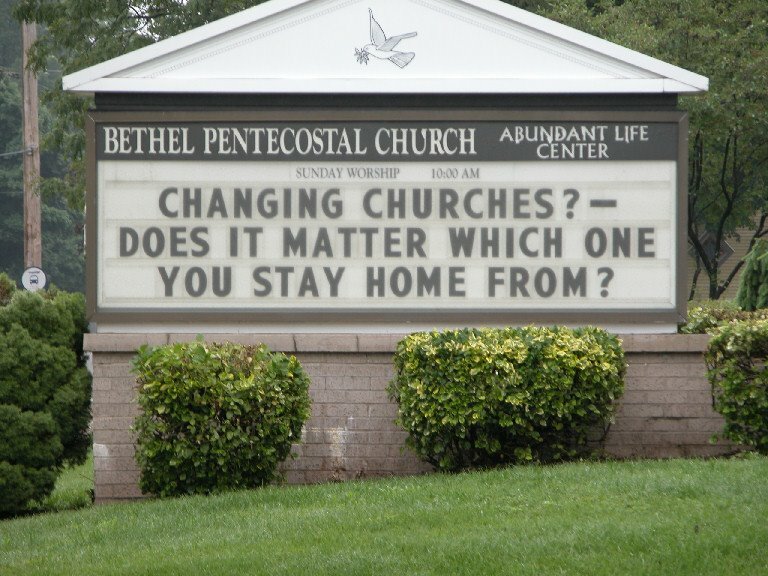 Nobody has the time, and most of the people who join our church are coming from other churches, anyway. We ask at the end of every service if there is anyone who wishes to join, they come forward, and we ask if they believe in God and as Jesus Christ as their Lord and Savior. If they say “yes,” they’re in. Our numbers are way up because of it. It isn’t about rules and regulations and keeping people out. It is about making it as simple as possible for people to enter the family of God. This pastor speaks for those who believe no one should be denied, and that church membership is of secondary importance to Christian community. Her comment points out the gatekeeper role of the local congregation and reflects a broad sentiment that any person who wants to say “yes” to Jesus Christ should not only be allowed to do so, but should be helped along in whatever way possible. I don’t disagree that we should be an open gate — but a gate still implies a boundary; something that distinguishes those who say “yes,” from those who have no interest. For me, there is a huge difference between making something simple and making it meaningless. I believe that many of our attempts to make Christianity simple have done little more than devalue the Christian life, resulting in an insipid, passive, and unproductive faith. The Christian life has substance. It makes demands. It requires action and practice. It must be learned and honed and perfected. It is a partnership agreement with God, the Holy Spirit, and faith community. It isn’t a hobby. There are very clear requirements and expectations. A person seeking to embark on the lifelong journey of Christian formation needs to know what this means, and then the choice is whether or not the person really, truly wants to pay the costs to reap the benefits. It costs very little to believe in Jesus Christ as the Son of God — you don’t even need a church for that. But to grow in the faith, to perhaps embark on the process of becoming a Christian disciple, to pursue a transformation in the Spirit to lead and teach and serve (whether as laity or clergy) — these require true church. The person seeking doesn’t get to make the “rules.” This would be like hiring someone and telling them their job is to do whatever the heck they want to. We make a passive, muddled attempt at offering some expectations in The United Methodist Church, but we have little or no accountability, so it all falls flat. We ask newbies if they will “uphold the church by their prayers, presence, gifts, service, and witness,” but offer virtually no guidance as to what we are really asking. We make assumptions that new “members” pray, that they know how to pray, that they have a disciplined prayer life, and that they will now include the “church” in said prayer life. Nine-out-of-ten United Methodists respond to the question, “What does it mean to ‘uphold the church by your presence? '” by answering, “Attend worship services.” Most UMs limit gifts to a financial contribution, service to “helping out at the church,” and witness as “going to church.” The problem here isn’t with people giving poor, low expectation answers. The problem is that leaders in the church offer no challenge to such answers. Another problem is that the percentage of “new members” who become “inactive members” within the first six months of joining a United Methodist Church crept above the fifty percent line in 2006 and kept going up. New members aren’t even being held to the minimum standards. Zero accountability. A person can “join” a United Methodist Church, never pray, never attend, never give, never serve, never share their faith and remain a member in good standing. What message does this send to the world about the value of membership vows in The United Methodist Church? We don’t even take members in anymore. People don’t want to join. Anyone is welcome to participate as they feel comfortable. Membership isn’t as important as engagement. I am in full agreement that membership isn’t the point. Membership has always been a means to an end rather than an end in itself. A membership process at its very best is an integration of a newcomer into the very DNA of the local congregation and the church universal. It is a process of inclusion into the identity and purpose of each congregational entity. It widens the circle we label “us.” It is an organic process of unification and growth. All this changed when the driving value of Methodism shifted from service to size. Once numbers ascended the throne, all bets were off. Getting bodies in the pews trumped getting new members into the body of Christ. If I were looking for a job, I would look for one that matched my skill and knowledge, could help me grow and develop and gain experience, that aligned with my core values and my vision for the work, and I would expect to give my best and in return I would want to be treated fairly. I would need to know what would be expected of me and how I would be evaluated. If I came away from an interview feeling uneasy about my prospective employer, I wouldn’t take the job. When I come away from a church not knowing what it believes, what it has to offer me and what it wants from me, and it doesn’t seem to know what it is there for, I don’t go back. Accountability to vows before God and a Christian community are not intended to “weed out” anyone, but to facilitate the emergence of those who desire a life in Christ. Accountability is not, by definition, punitive. Actions must have consequences. When people perform well and follow-through on their word, this should be recognized and celebrated. When people perform poorly and fail to keep their vows, there should be consequences. And when people hear what is required and say “no thank you,” then we should honor that, but in no way should we keep lowering our expectations until they are willing to say “yes.” Being a Christian — and more pertinently, being a Christian disciple — comes with some demands. It is up to each and every individual to decide whether or not they want to meet those demands, but this is their choice. The body of Christ needs to be clear that membership in the body means something, and that all are welcome — as long as they are willing to take seriously the promises they make to God and the community of faith. @LifeLongUMC… The CtA Committee studied only UMCs in the US. John Savage’s research, however, has been much more widely ranging, as has the work of Kenneth Hauck (founder of Stephen Ministries and author of several well documented books on ministry with inactive members– also compromising a variety of denominations and non-denominational churches). I’m not really sure why the research on this, that worship is fairly irrelevant to “sticking,” seems not to faze your critique of the reason for UMC decline being un-meaningful or not enough styles of worship. It honestly doesn’t make the cut of the top 5 in most of the research. Those are almost always about relationships or the lack thereof. @ Jim–you hit it: “What questions should we be asking?” If we knew, we’d do it, right? I’m not so sure that everyone wants to hear the answers. Okay, I’ll just brainstorm here; I don’t claim to know. That’s why I’m appreciating this discussion! Encourage small groups to go together to worship at other churches once in awhile. (Yes, give permission to explore! If they leave the UMC, they are exploring anyway!) Bring in guest musicians, teachers, drama. ASK what attendees thought about it. Take the confirmands to different worship experiences, (yes, even outside the UMC) and expose them to new music, different worship settings and styles of preaching and teaching. Ask them their impressions. And listen. We claim to have open minds. So exploring, discussing, listening should be something with which we are very comfortable. We’ve had a lot of campaigns with catchy slogans through the years. Yet we steadily decline. I miss those people that have come and gone yet I think if we asked them the above questions, we’d understand why. I don’t know the answers, or even all the “right” questions, but I appreciate this blog very much and the discussion you each, as participants in it , are affording. I think you can see that I care very, very much about out church. I thank you very much. @ Taylor. I am trying to learn more about the results of the research. I appreciate your directing me to it. But I’ve seen and heard a lot of research through the years. And we don’t seem to be getting stronger as a denomination overall. I can only speak from my own experience through a large network friends around the country– It just seems to me that the connection between people’s attendance at worship and their likelihood of getting involved in the church (thus forming relationships that “stick”) is a big issue. Of course, the churches that put a great deal of focus on worship ALSO already have opportunities at the ready for new members to connect and form relationships. The two seem very connected. At least to the folks I know. But that’s all I can do, is share my experiences. I see things in some places that sure are working, and others that don’t seem to be. I think it’s good ask the questions and listen and learn. That’s what I’m doing. I don’t claim to know. That’s why I’m asking and appreciate the feedback; I love my church and hope we can thrive. Thank you. @Lifelong. Your questions are really probing. If our local churches were to ask these questions and really listen like you say there may still be some hope. However, I fear the real catch is if they really listen that will not like what they hear. My first informal try with the questions generated a bunch of rather negative comments. Admittedly a very situational setting in which I asked but to garner such large negative responses is interesting. @Jim (and Taylor and Dan) – thanks for listening. It’s hard to ask the questions. There is risk our intent will be misinterpreted. There is risk in answering the questions, too; people may not be honest for that reason. Admittedly, it is much easier for me to brainstorm questions anonymously on Dan’s blog than in person. Maybe someday I’ll be more bold, but I do fear I may come across as somehow “abrasive,” which is not at all my intent. I just want the UMC to be a church to which my own adult children might choose to belong. A church that meets the needs of many who are not now in attendance. A church that thrives so that we can go out and care for the world in even more ways. Thank you all , again, for listening and participating in the discussion I raised. May you know joy and peace in this blessed season and always.